HA! Here is the GREEN card and surprisingly it is really green. Unfortunately you cannot see how extremely fancy this card is, but at least you get a glimpse of an idea about the front side. There is my picture with a small hovering hologram on top with interesting looking coat of arms. On the right side you can see The Statue of Liberty and of course she is bigger than me. Another hologram of me is on the back side of the card surrounded by flags of all american states and all presidents. My name and my birthday are on the card 5 times, so that I will never forget it. 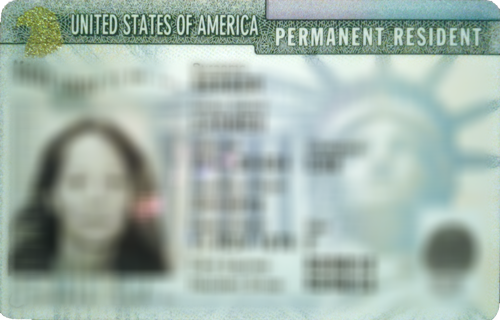 The title says “permanent resident” but it will expire in 2015. I had to laugh about that little paradox. If anyone knows more about how a paper envelope can protect wireless communication and also how wireless communication works with a card like this, please let me know. and a lot of other documents and evidence, including taxes, bank statements, property documents, birth certificates, medical examination (including blood tests, rays and my refusal of getting vaccinated), phone bills, rental agreement, joint bank account, photo album and much more. After many telephone calls and visits with/at the USCIS we finally can lean back, stop communication and paying more money. Considering the fact that we are a REAL couple, this whole immigration process was/is: fascinating, annoying, shocking, amazing, tedious, frustrating, unbelievable, informative, confrontational, funny, terrible, horrific, time c o n s u m i n g and especially testing the relationship! We started to gather material in the end of March 2012 and filed our case in June 2012. In the beginning of October they started to demand additional documents and denied me in the end of November 2012 while I was on a parole document (that is the official name) in Germany! 2 weeks later after more (and probably the right evidence) they approved my case. Last but not least we had an interview with an officer at the USCIS to check if we are honestly a real married couple. A week later I had the fancy card in the mailbox. This entry was tagged A German woman living in the US, Green card. Bookmark the permalink. Yes, I will write about the interview with Mrs. Rose, it was quite a thing! I guess that’s why they say, “Give me your tired and your poor.” After filling out all the paper work, paying the fees and going through the whole process – you’re tired and poor! Hahaha! Your comment made me laugh! Thank you for that. Danke für die Glückwünsche. Ja, es sieht wohl so aus, dass ich nun länger in Amerika bleibe. Aber wer weiß … Ich finde es auch immer wieder schön, dass unsere Begegnungen so unkompliziert sind. Irgendwie entwickelt sich unsere Freundschaft trotz der Entfernung, vielleicht ja aber auch genau deshalb? Anja und meine Mutter kommen morgen Abend in San Francisco an, aber ich glaube es erst, wenn ich sie sehe. Dicke Umarmung zurück nach Münsingen! Ich hoffe Dir gehts gut und ich schreibe Dir bald mal ne längere email.